The levels of audio effects in the NPE has been tweaked. Mac: Remove Cider support from the client. Fixed text in mini skill injector description. Mini Skill Injectors now work for characters with up to 1.500.000 skill points, as some players were getting stuck due to the old limit of 750.000. We are aware that the info window still incorrectly says the limit is 750.000 skillpoints. Fixed an issue where EVE Voice was not working. New characters on accounts created before the Ascension expansion on Nov 15 are now able to play the new Inception tutorial. Fixed a problem with onlining engineering service modules, which happened mostly when installing several service modules at the same time with drag&drop. Fixed a crash that occurred when changing interior graphics settings. Redeeming items from the character selection screen will no longer fail with a confusing message if you are in a ship added to the game at a later date than the Hecate. We don't want to talk about it. Fixed skill point total for Alpha characters so it now includes disabled skills. Fixed the date in the tooltip for the Skill Queue start button when playing in German. Fixed an issue where the Omega symbol would appear on corporation logos in the Show Info window of deployables when launched for corp. Fixed an issue where editing a biography would not save properly when changing directly to a top level Character Sheet tab. Fixed an issue where the preview for apparel in the New Eden Store was not appearing properly. Inception tutorial: fixed UI highlights persisting after their corresponding UI element was removed. Reconfigured citadels which failed to online engineering service modules correctly. This also fixes a problem with loading the facility tab, when such a citadel should have been listed. Affected service modules might need to be installed again. New Eden has been made a better place by fixing potential exploits. Fixed visibility of the market graph after tweaking display options. Fixed a crash that occurred when exiting the Captains Quarters. Fixed a bug which resulted in reduced server performance due to generation of too many logs. Fixed an issue where station services would not load properly when a client was launched with a stacked character sheet. Fixed some missing notification setting strings. Industry window: Entries in the "Blueprints and Jobs" tab, which are located in structures, are now showing the proper facility sub-menu and allow setting the destination to the structure. Fixed an issue where items with fulfilled requirements, but missing pre-requirements, would display the "Add to Queue" button in their tooltip. Tweaked the appearance of ship group bonus skills in the ship tree when you've trained the required skills for that group. Added proper validation messages when attempting to extract over-trained skills with a skill extractor. An issue with drones not using their combat orbit velocity has been resolved. Pirate mining operation Strong Boxes will now always give rewards when opened. The hauler rate for Strong Boxes has been very slightly increased. Corrected an issue that would cause mining anomalies to fail if the last mining event in the site was from a mining drone. Redirected errant traffic routes around the Sotiyo. Pruned unnecessary data relating to Engineering Complexes. Recolored the forcefield on Gallente Administrative Outposts. The 'Battle Preparations' operation will no longer skip the first task to "Redeem Items", until you have done so. Package crates are now set to the volume of the total volume of all items inside, to prevent you from trying to open the create while in space inside your corvette. Resolved some minor grammatical errors changes to texts. Fixed the formatting of the operations info panel when it is viewed on the mouse over tooltip while it is hidden. Arithmos Tyrannos now once again furiously attacks any careless capsuleer that incurs his wrath. Fixed an issue where the character portrait would not render when the character sheet was stacked. Fixed an issue where the 'Character sheet' header would reload when fitting modules in the 'Fitting' window and both windows are open. Several improvements have been made to the backend system. The capacity for personal saved ship fitting has been increased to 250. The material costs of Standup Engineering Rigs have been reduced to be in line with the dev blog. Fitting Simulation: The correct fitting name will be used now when dragging a ship fitting from the simulation mode button. Fitting: Tactical destroyers will no longer show fake mode modules in the module list for the estimated price. Tweaked the size of the buttons in the character creator. Fitting simulation will now default to the currently active ship at opening and will no longer return to the previously simulated ship (as this caused confusion). A suppressible confirmation window is shown when leaving fitting simulation with open changes, to ensure no progress is lost. Rorquals will no longer be able to sneak into Thera. Adjusted the camera movement when viewing ship explosions. Fixed an issue with UI highlights sometimes incorrectly flickering. Operations: alternate zooming methods will now complete the zoom camera task. Fixed an issue causing some players to get stuck at the spatial rift, unable to warp. Fixed an issue where skills were not being trained properly after accounts changed their clone grade. Fixed an issue that would enable the greenscreen feature in the character sheet header. Fixed an issue in tactical camera where clicking on objects in space would not select them. Added the current level and skill point information to tooltips for skills in the character sheet. Fittings, including service modules, can be exported now. Audiobanks have been modified to prevent some atmospheric sound/music from continuing beyond certain NPE sites. Attempting to warp or jump while there is a disallowed module inside the cargo of ships inside your Ship Maintenance Bay will now move those modules to the cargo space of the top level ship, allowing normal movement. This corrects the known issue affecting capital ships with command processors fit to ships within their Ship Maintenance Bay. The blueprint originals for the tech one Command Processor rigs are now seeded across a variety of NPC stations. Beacons for sovereignty command nodes are now disappearing correctly at capturing of the command node. Re-calibrated the calibration of the "Standup M-Set Ammunition Manufacturing Material Efficiency" rigs. The Drifter Battleships and Autothysian Lancers will now correctly change speeds depending on their current action. Fitting window: Active modules and command bursts are now changing the displayed align time in the fitting window in space. Fitting: "Save As" uses now properly the current ship name after leaving simulation mode. The Command Processor I mid-slot module will be converted to a Medium Command Processor I rig. Any instances of this module currently fitted to a ship will be unfitted before conversion and moved to the ship's cargo hold. Note that the Command Bursts modules require Command Burst Charges in order to operate. These charges were introduced in the previous release in order to allow supplies to be built in advance. The Industrial Core module has been significantly improved, and a new tech II version has been added. The Pulse Activated Nexus Invulnerability Core module is a new Rorqual-exclusive defensive superweapon. It allows the Rorqual to make itself and its allies invulnerable for a short time. This new module requires a new rank 8 skill called Invulnerability Core Operation. Phenomena Generators have been introduced. Titans will be able to fit these new modules (one per race) that apply timed bonuses and penalties to ships over an extremely large area. Unlike Command Bursts, Effect Generators impact ALL ships within their defined area (friend or foe). Entosis Link I module now requires Infomorph Pyschology II (was Infomorph Psychology I). All small artillery weapons have had their powergrid requirements reduced by 2. NPC Mining Operations will now appear across the New Eden cluster. Haulers come to carry away the mined ore, and if killed can drop rare strong boxes. If attacked, or you have terrible standings to that corporation, they will call for reinforcements. The reinforcements are formidable, and will act like players. Caldari: Deep Core Mining Inc.
Aura has been fully re-imagined and all her vocal samples have been updated. A brand new guiding tutorial experience has been created for Ascension. Four new ‘Mentor’ non-player characters will guide new users through a tutorial journey crafted for their chosen race. The updated Aura will also play a large part in this experience, guiding you through your first moments of EVE Online. Please note, that for the Ascension release only brand new accounts with new characters will be able to participate in the updated tutorial. The brand new Star Captain SKIN is now available for the Confessor hull. In celebration of the launch of the Ascension expansion, the New Eden Store is hosting a massive sale of all store ship SKINs. The build, research and copy times of capital and structure blueprints have been increased. Find the details and discussion in this forum thread. The Porpoise is a new ship Industrial Command Ship that fills the hole at the bottom of the mining foreman ship progression line (further information). The Orca is receiving a massive overhaul, with huge buffs to almost every attribute. It will be a mining powerhouse, a heavy duty ore hauler, a significant combat deterrent, and the strongest foreman burst platform available in highsec space (further information). The Rorqual is getting a revamp from the ground-up - It will be capable of providing strong Mining Foreman Bursts, repairing allies and fighting off enemies, and vacuuming up ore faster than any other ship in New Eden (further information). 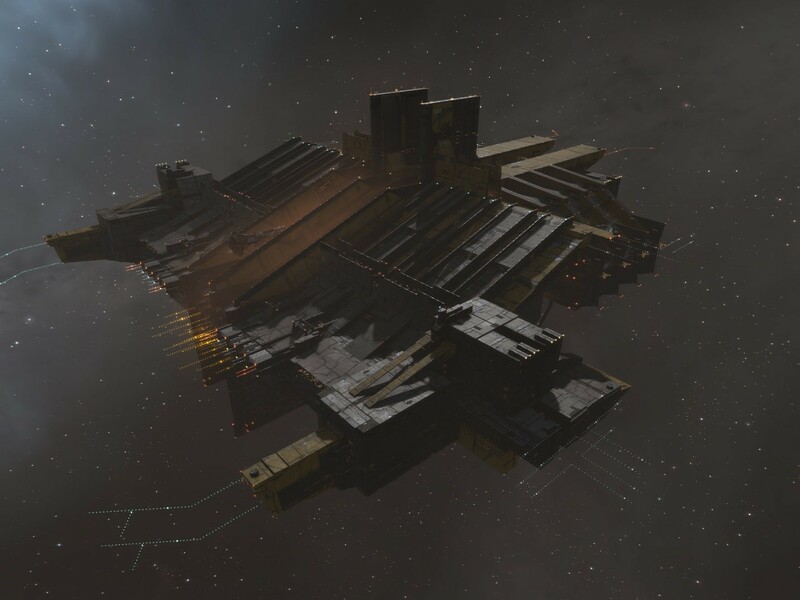 The Rorqual will no longer be able to dock at Astrahus citadels, in order to bring its docking restrictions in to line with other capital ships. The unpackaged volume of Hulks and Covetors will be dropping by 25% to make them easier to haul and store. Tactical Destroyers have been rebalanced. All the details and discussion can be found in this forum thread. The new Sunesis destroyer has been introduced. Find the details and discussion in this forum thread. The jump ranges of most capital ships have been increased. Find the details and discussion in this forum thread. Mining Drone Specialization: 2% bonus to the mining yield and max velocity of drones requiring Mining Drone Specialization per level. Ice Harvester Drone Operation: 5% reduction in ice harvester drone cycle time per level. Ice Harvester Drone Specialization: 2% reduction in cycle time and bonus to max velocity of drones requiring Ice Harvester Drone Specialization per level. Added new skill Invulnerability Core Operation - requirement for Rorqual's new PANIC module. Added new skill Spatial Phenomena Generation - requirement for Titan's new Phenomena Generator modules. The requirements for training the Command Ships skill have been adjusted, significantly reducing the time required before the skill can be obtained. Find the details and discussion in this forum thread. When undocking any ship from a Citadel or Engineering Complex that would not be able to re-dock at that structure, a warning confirmation will now be displayed explaining that this will be a one-way undock. The number of service module slots on Citadels have been reduced. The details and discussion can be found in this forum thread. The skill queue will now pause and restart without intervention after a Clone Jump. A new character sheet has been introduced for EVE Online: Ascension. Omega restricted items will have a gold border in the Inventory, Contracts, Market, Assets and Industry window. Omega items have the Omega item added to the Show Info window. Minor text changes to Fast Checkout window when Fast Checkout needs to be activated. The buff-bar has been enhanced to support the new Command Burst mechanics. The buff-bar is designed to show timers that are associated with your ship. The incoming buffs that your ship receives from Command Bursts will now show up in this area. There will be one icon for each of the 5 Command Burst categories. A timer animation will show the duration of the buff, and tooltips will give more details of individual buff durations/values. A number of other buff/debuff effects have been also integrated in to this system, including the Titan Phenomena Generators, Supercarrier Burst Projectors and the Rorqual PANIC module. The warp-scrambling debuff side-effect of super-weapons will also appear here, showing the countdown until it has cleared. Timers that are associated with your character (such as Criminal flags, Weapons timer etc) will continue to appear in the upper-left of the screen - these will follow your character regardless of ship switching (including whilst docked in station). Searching in personal assets and in corporation assets is now also returning items in structures like Citadels and Engineering Complexes. Several changes have been made to the fitting window. Most notably is the addition of the Fitting Simulation. When mouse-over modules while in normal fitting mode, the fitting window will no longer show preview in yellow text. This functionality has been moved to simulation mode, which provides an accurate preview. Textures in the fitting window have been updated. "Alpha strike" has been added to the damage section. Damage sections now show combined dps with a tooltip that details how the dps is divided between weapons systems. In addition to raw dps, it also displays dps with module reload times taken into account. A 'Fuel' section has been added for structures. It shows how much fuel the online services consume per day. A 'Drone' section has been added to the fitting window. The drone panel lists bandwidth and drone control range of the deployed drones or the top drones in your drone bay. "Align time" has been added to the navigation section. This is the time it takes for a ship to go into warp from a standstill. Armor repair rate in the defense section now takes into account whether Ancillary repairers are charged or not. Capacitor simulation estimation now takes into account capacitor boosters and their reload times. Saving fitting from fitting window will now include the load charges. Effective hitpoints now assumes omni-damage, rather than the damage the ship is weakest to. The ship name has been moved to the left side of the ship. Price estimation of the fit has been added to the fitting window. It has a tooltip that lists the prices of the ship and the fitted items. The prices used for the estimation are the global averages for each of the types. The 'Save' fit button has been moved to a new panel in the left side of the window. The panel can be accessed by clicking the 'Browser' tab. The 'Strip' button has been removed. This option is available in the ship's right click menu. The windows will now use icons to indicate whether the fit is personal or corp owned. For corp fittings, by default, the ‘Save’ button will save the fits as corp fits, but for personal or unsaved fits it will save it as a personal fit. For those with the corp role Fitting Manager, the 'Save' button will have a tooltip allowing you to save it either for the corp or the character. The name of the fitting can by modified by clicking the fitting name. The 'Rename ship to fitting name' has been moved to a setting wheel. Fits can now be imported and exported from the fitting window through the ‘Import & Export’ option in the left panel of the window. Fixed a case where it was possible to end up with a T3 cruiser with missing subsystems after applying a fitting from a link. It is now possible to trash asset safety wraps. Corrected the materials received when reprocessing the Standup L-Set Ice Grading Processor rigs. Added a new NPC type to the NPE called ‘Circadian Seeker’ and renamed the old ‘Circadian Seeker’ to ‘Autothysian Lancer’. Fixed an issue which could cause a momentary client lockup for players logging into the game while in space. Items of deleted character, which are inherited by the corporation, are now being sent to the corporation deliveries hangar (instead of to the first hangar division). The Crucifier Navy Issue Cold Iron SKIN (Permanent) is now available on the market. Positioned launcher locators on the Typhoon to prevent overlap. Adjusted visibility of turrets in hangar for low LOD quality. Tweaked logo placement on the Gallente Marauder Kronos. Corrected the looping animation on the Angel Frigate Echo. Hacked in icons for cyno beacons. Nailed down a section rail on the ORE Barge Retriever and variant to comply with health and safety. Offset the logo decal on the Minmatar Command Ship Sleipnir. Touched up the paintwork on the Ore Freighter Orca. Erased the interior projection of registry decals for the Gallente Frigate Incursus and variants. Stitched up the Blood Raider's jacket to close a gap with midlayer options. Training queue: changed from "file d'attente de compétences" to "file d'apprentissage de compétences"
Materiel efficiency: "Efficacité matérielle" is now "Efficience matérielle"
Info shard: "Fragment d'information" is now "Partition de données"
Location marker: "Marqueur d'emplacement" is now "balise astrospatiale"
The citadel docking restrictions for the Rorqual now correctly match those of other capital ships. This means that Rorquals will no longer be able to dock at Astrahus citadels. You can no longer invent a Capital Capacitor Booster II blueprint from a Capital Compact Pb-Acid Cap Battery blueprint. Resolved an issue which caused some brief client stutter when logging into a character that is in space. Fixed a timing problem, which could in rare cases lead to being tethered to a citadel while being many AU away from the citadel. Fixed a rare problem where all weapons in a solar system failed to cycle. Fixed an issue where asset categories in the character creator were sometimes missing, which could make it impossible to finish character creation. The description of the "Standup Weapon Disruptor I" has been updated with the correct name of the module. Fixed an issue with using the clipboard for ship skills in multibuy. Fixed an issue where the screen in the captain’s quarters would fail to load a scene and therefore stop cycling through all available scenes. Show info windows for charges no longer fail to show their "Used With" tab the first time they are loaded. Removed all references to EVElopedia from in-game texts. Removed duplicated attributes from the misc. section of the show info windows of structures. The "Market deliveries" hangar for corporations has been renamed to "Corporation deliveries" in the inventory window for clarity. The trade window has been stabilized to no longer break when trying to add an un-tradeable item to it. Fixed an issue where it was possible for the camera to break when using the "Look at" command at long ranges. The service module slots in the fitting window will now highlight correctly when hovering over a service module in the inventory. The fitting window now remains open when taking control of a structure. Fixed an issue that would cause the fitting window to comically oscillate when expanding or retracting the side information panels.